While 2017 may have been the warmest year on record in Florida, the start of 2018 is proving to be frigid. 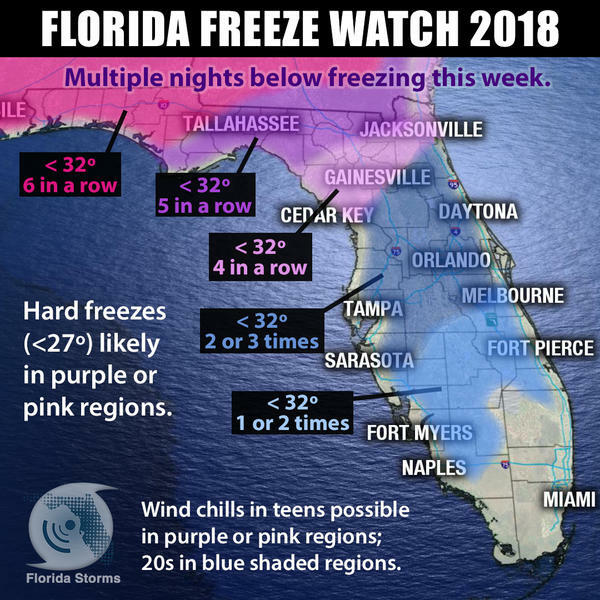 A freeze is likely in portions of the Sunshine State each of the first seven mornings of the new year, with multiple hard freezes in a row possible north of Interstate 4. The brutal air mass that cancelled New Year’s Eve celebrations in dozens of states could send subfreezing temperatures as far south as Lake Okeechobee by week’s end. The arctic front’s effects moved through north Florida in the morning hours Monday and crossed the I-4 corridor between Tampa and Orlando by midday. The temperature spread across Florida on the first day of 2018 will be remarkable, ranging from near freezing during the day near Pensacola to the lower 70s in Miami. The front will keep moving south Monday night, but likely slow to a crawl before reaching Miami. A storm system is expected to form along the front in South Florida Tuesday, moving offshore and toward The Bahamas Wednesday. Moisture is likely to be enhanced and pushed further north by the area of low pressure, resulting in more widespread precipitation along and south of the I-4 corridor both days. The cold air will make itself at home in north Florida and across the panhandle where subfreezing temperatures are likely both Tuesday and Wednesday morning along the entire Interstate 10 corridor. As the midweek storm system exits, this will open the floodgates for an unobstructed delivery of arctic air deep into Florida. A secondary surge from Siberia – literally the source of this air mass – will arrive Thursday and Friday, sending the possibility of a freeze this weekend all the way to the north shores of Lake Okeechobee and outskirts of Fort Myers. Temperatures are likely to be at least 10 degrees below normal across the entire state, and at least half of the state will experience wind chills below 25 Friday or Saturday morning.